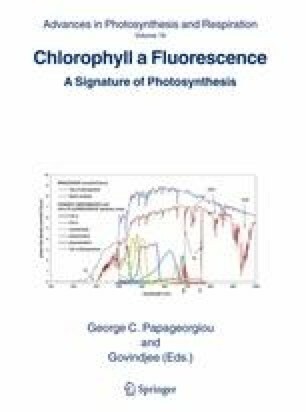 This chapter deals with chlorophyll (Chi) a fluorescence signals and describes how fluorescence transients, known commonly as Kautsky curves, exhibited by photosynthetic organisms under different conditions can be analyzed to provide detailed information about the structure, conformation and function of the photosynthetic apparatus and especially of photosystem (PS) II. The emphasis in this chapter is on the work done by R. J. Strasser and his co-workers. The analytical formulation of the biophysics of the photosynthetic apparatus, according to models of different complexity regarding both the architecture of the photosynthetic unit and the modes of energetic communication among the pigment assemblies, as well as their links to the experimental fluorescence signals are derived, based on the so-called ‘Theory of Energy Fluxes in Biomembranes’. In this framework, the derivation of simple mathematical formulae expressing the energetic communication among PS II units, called in the literature as ‘grouping’ or ‘connectivity’, is presented in detail and the ‘overall grouping probability,’ which takes into account all possible pathways of communication, is defined. The chapter starts with fluorescence transients exhibited (a) in the presence of DCMU (3 -(3,4-dichlorophenyl)-1,1 -dimethylurea) at room temperature and (b) at low temperature (77K), i.e. under conditions that reduce the complexity of the in vivo system, and then focuses on the analysis of the polyphasic fluorescence transient under physiological conditions, with emphasis on the fluorescence rise kinetics O-J-I-P (labeled also in the literature as 0-IrI2-P). The analysis of strong actinic light-induced O-J-I-P transients by, what we call, the ‘JlP-test’, which can be applied at any physiological state and for the study of any state transition, is presented in detail; it includes the full derivation of the formulae for the constellation of experimentally accessible parameters. These include the so-called ‘specific’ and ‘phenomenological’ energy fluxes, the yields, the fraction of PS II reactions centers (RCs) that can not reduce the primary quinone acceptor of PS II, QA, called as heat sinks or ‘silent’ centers, the fraction of RCs that can not reduce the secondary PS II quinone acceptor QB, as well as the overall grouping probability. The influence of the donor side of PS II on the fluorescence kinetics, with emphasis on the appearance under certain conditions of an early step (at about 300 μs, labeled as the K-step) in the regular O-J-I-P fluorescence transient, related to the inactivation of the water splitting system, is also discussed. Moreover, results from numerical simulations of the O-J-I-P transient are summarized with emphasis on the investigation of the possible role of the PS II primary acceptor pheophytin. The chapter closes with the presentation of recent advances, achieved by simultaneous in vivo measurements of Chi a fluorescence rise kinetics and P700 oxidation kinetics.